Free is up to two projects and 5 GB of data storage. Premium starts at $9,99 per user/month. 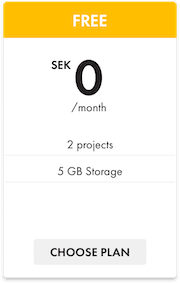 Free is up to two projects and 5 GB of data storage. Premium contains an unlimited number of projects and 100 GB of data storage. The monthly fee for premium is $9,99 per user. No minimum contract period. 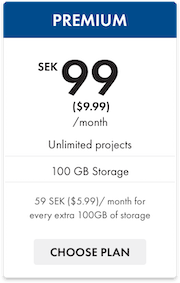 100 GB of extra data storage adds $5,99 to the monthly fee.